The nation and state have made strides in breaking barriers created by systemic, historic racism and bigotry, obstacles still remain. 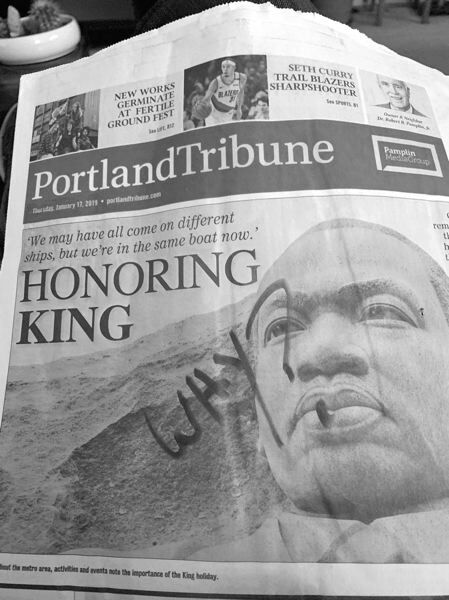 This image was sent to us by a reader who found the newspaper on the top of the stack of Portland Tribunes delivered to his Southwest Portland apartment building Thursday, Jan. 17. Someone (a neighbor? a passer-by?) wanted to know why we were using our front page to promote the upcoming events honoring the Rev. Dr. Martin Luther King Jr.
• The poverty rate for black Oregonians is nearly three times the rate of white Oregonians. Latinos and Native American residents are twice as likely as white Oregonians to be poor. • White students in Oregon are twice as likely as black and Latino students to pass their standardized math tests. And the graduation gap, despite progress in recent years, remains. About 77 percent of white students graduate, compared to 70 percent of Latinos, 66 percent of African-Americans and 56 percent of Native American students. • Many studies have shown that Americans commit crimes at roughly equal rates among racial and ethnic groups. Yet, Oregon's black and Native American residents, who make up 4 percent of the state's overall population, account for 9 percent of the prison population. • A 2017 investigation by Pamplin Media Group and InvestigateWest found that black motorists in Portlanders are three times more likely than white drivers to be charged with failing to use the lights and black pedestrians four times more likely than white residents to be ticketed for littering. That same investigation found the same pattern held for Latino motorists throughout the state. • While communities of color have made recent strides in reaching political office, many public and private institutions in Oregon (including this company) do not have management staffs or boards of directors that reflect the diversity of the communities they serve. Finally, we chose to promote the events honoring King because in a world in which political discourse seems perpetually polarized, his remarkable achievements remind us of the power (and perils) of searching for middle ground. King was criticized both by those who saw his calls for equal rights as too radical and those who viewed him as a tool of white politicians. While accepting the Nobel Peace Prize in Norway in 1964, just a month shy of his 36th birthday, King defended the tactic of nonviolent protest. "We will take direct action against injustice without waiting for other agencies to act," he said. "We will not obey unjust laws or submit to unjust practices. We will do this peacefully, openly and cheerfully because our aim is to persuade." Earlier in the speech, King decried the "deep rumbling of discontent" of those days and reiterated his dream saying, "I have the audacity to believe that peoples everywhere can have three meals a day for their bodies, education and culture for their minds, and dignity, equality and freedom for their spirits." That deep rumbling of discontent can still be felt today. And while King and his supporters persuaded enough of his fellow Americans to support the goal of equal rights under the law, that dream clearly has not be realized in practice. So, that's why we chose to remember his work. To both celebrate his accomplishments and to remind ourselves that much still needs to be done.